What is this Vietnamese Food? Several years ago, I had a friend of Vietnamese descent. She went back to visit her home country and returned with gifts. I was given a box (possibly yellow) containing several foil-wrapped cubes or rectangles. They were a sort of caked or compressed powder, and somewhat unpleasant to eat. I have since lost touch with my friend, but I would love to be able to track down (or at least identify) this food. I remember that the first ingredient listed was "grease pig." Texture is very much like a boullion cube - hard, with a bit of sticky give when pushed. Salty, as expected, but also sweetish with a distinct flavor of caramelized onions and star anise. Does it's look like this? 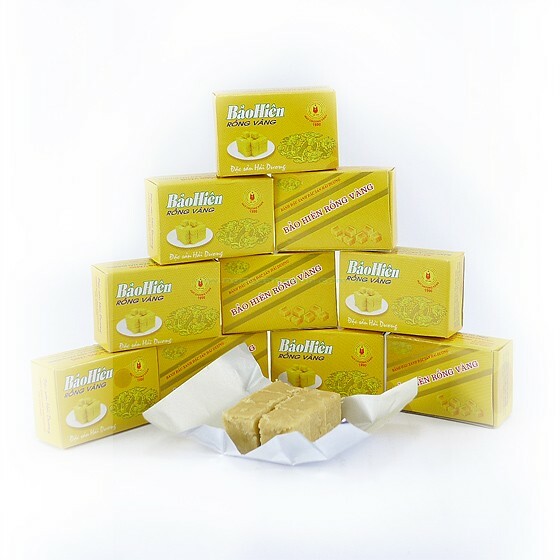 This cake is made from mung bean powder and it is bright yellow. Once upon a time, it was wrapped in plant leaves, but today, it is factory-produced and wrapped in foil. 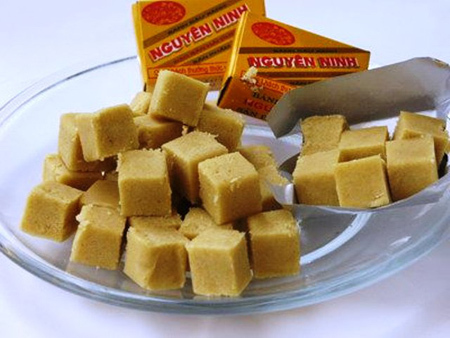 The Mung bean cake, or Bánh đậu xanh, tastes very sweet. It is served with tea. Not the answer you're looking for? Browse other questions tagged food-identification vietnamese-cuisine or ask your own question. What is the name of this Israeli street food? What is the name of this french food? What is this food “cr of leek and pot 21814”? 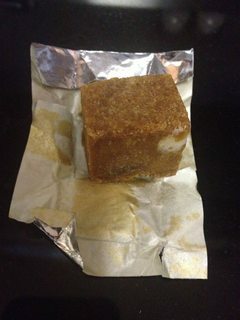 What is the name and preparation style of this type of tofu?